Descended from a long line of Texas ranchers, preachers, and teachers on one side and Kentucky horse thieves and moonshiners on the other, Kathleen Rice Adams had no choice but to become an outlaw. For the past thirty years, she’s stayed two steps ahead of a lynch mob as an award-winning news writer, editor, and columnist. When she’s not chasing the news, she commits crimes against fiction. Find her online at KathleenRiceAdams.com. "Classic tales of the Old West...that never forget the power of love." 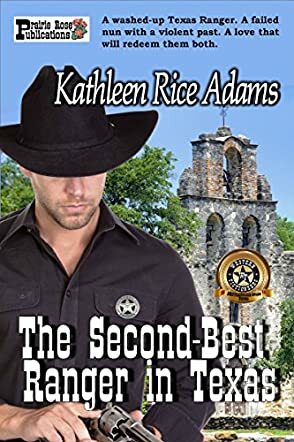 The Second-Best Ranger in Texas by Kathleen Rice Adams is a short historical romance about Texas Ranger, Quinn Barclay. His friend and partner was murdered in a grotesque fashion, and we meet Barclay in a saloon, drowning his sorrows in booze and women. He is cashiered because of his drinking and insubordination, so he sets off to fulfill his partner's dying request to save a young woman. He only has the girl's name, Dulce, that he's supposed to rescue from unknown circumstances. Dulce took temporary vows and had planned to become a nun, but has since decided it was a mistake to follow her childhood dreams, and now wants to leave the mission that sits in the middle of nowhere. When Quinn arrives at the mission, the scene unfolds, the truth about Dulce's identity, her past, and the death of their mutual friend comes to light while love grows between the two. Kathleen Rice Adams paints a descriptive picture of setting and characters in her historical novella, The Second-Best Ranger in Texas. Even Barclay's horse, Bulls-Eye, has a personality. Dulce and Barclay form a connection within the limited pages that can be difficult to attain, but this author makes you care about them both and believe they are falling in love. She weaves a story of circumstances that show the depth of their strengths and weaknesses, and show they are human. There are also confrontations and action scenes that are highly exciting. I enjoyed this story and would recommend it as a quick, exciting read that leaves you wanting more.